Would You Like a Beautiful New Door? When it comes to renovating the rear of your property, patio doors are going to be a key feature. Not only do they provide convenient access with great security, they open up the room with natural light and a garden view. The term “patio doors” is often for any kind of door that opens onto a patio, terrace or garden area. Traditionally it referred exclusively to sliding doors, but now it often includes bi-folding and French doors too. The type of patio door you can use will be dependant on the size of an opening, design preferences and budget. Each has their own features and benefits for different applications. Within this article, we will explore the key differences, suitable applications and cost of patio doors. With new builds or extensions, you have the greatest flexibility when installing patio doors. You can tailor your opening to the type of patio door you wish to use. But if you are having new patio doors fitted in an existing opening your choices may be restricted. 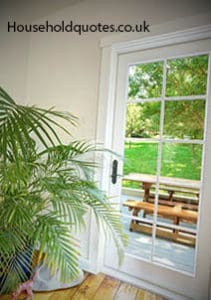 French doors are best suited to smaller openings. Their design resembles a set of double doors and typically opens outwards. uPVC French doors are the most common, usually fitted with additional side or top lights to fill the entire opening. Other materials such as aluminium can be manufactured wider and taller to negate their need. At an increased cost you can have less material and more glass within a French door design. The security of French doors is regarded highly due to multi-lock systems. Many have passed the rigorous PAS024 security testing. The key advantage of French doors is the option to open a single door for access. When weather conditions are less favourable you will be grateful. Yet when the sun is out, both doors can be opened out wide. By design, patio doors are opened by sliding along on horizontal tracks. If space outside is restricted this is highly beneficial. So if your patio or garden area is small, sliding patio doors beat both French and bi-folding doors. Another benefit is the fact they cannot be blown closed, as can swing operated doors. Sliding doors can easily fit within wider building openings. Again, aluminium allows for even greater sizes, more glass and less material. Up to 5m wide or 3m high is achievable. High-quality rollers are used to make heavy doors easier to slide during access. Door technology has progressed from single tracks up to three. Designs use multiple doors that slide independently, providing the greatest flexibility for operation. You will usually find two to four pane sliding doors, more can be seen in bespoke designs. Built-in multipoint locks are used where the panels overlap. This also provides excellent security. When it comes to truly opening up your home, even at the corners, bi-folding doors are a top choice. Their greatest advantage is the fully opening operation, covering the widest building openings. For those looking to breakdown the barrier between inside to the outside, the other doors can’t compete. Different designs will provide varying degrees of flexibility. But as a whole, bi-folding doors are best suited to the greatest opening. For small openings of 2m, you won’t receive more opening than French doors, also, you loose the ability to open a single door. You may also need to consider adding a single swing-opening door. This additional door at one side can provide access without having to completely open up your home. Bifolding doors are far most costly, best suited to openings exceeding 2700mm and without outside space limitations. The price of patio doors can feel confusing at first, prices really spike up depending on design, material and dimensions. Use this guide to get you going when comparing patio door price. Get FREE Patio Door Quotes Today! These prices should be considered the bare minimum, for standard sizes off the rack. Larger dimensions and more expensive materials/finishing will increase the cost considerably. Expect these prices to double or even triple. If you are confident in your ability, installing patio doors yourself can save a considerable amount of labour. Yet, if you need to ensure the job is done properly, hire a professional joiner to complete the work. To estimate your potential patio door installation costs, use these sample installation jobs as a ballpark. This will cover a standard sized opening, for 1.2m x 2.1m patio doors, based on a tradesmen’s rate of £150 per day and labourer on £100 per day. You can plug-in your own patio door price for an accurate estimation on your own project. – For glazed wooden French doors add an additional £325 to the patio door cost. – For Georgian doors add £575. If you are modifying/creating an opening for patio doors to be fitted, you may need a load-bearing lintel installed. When comparing quotes between professional builders, make sure this additional work is included. In some cases, a structural engineer may need consulting, expect an additional cost of around £100. Whoever carries out your patio door installation must be part of a Competent Persons Scheme. FENSA and CERTASS are the most common, yet there are many other participants. Otherwise, you will have to pay a £200 fee to your local building control to certify the completed work. Get Your FREE Patio Doors Quotes Today!